Looking for a great, highly rated, draft only, IPA that you can only get in one city? Skip the plane ticket to Cali or Vermont and drive on up to Columbus instead! When I say this is highly rated I mean a 98 on both Rate Beer and Beer Advocate plus on Beer Advocate’s list of top Double IPAs this comes in at #20 making it the “best” DIPA in Ohio! The Columbus Brewing Company has been making their double IPA, Bodhi, for a few years now and have kept it on draft only and rarely distribute those kegs outside of the Columbus area. Luckily it’s relatively easy to score in Columbus and quite a few places offer growler fills of it. My wonderful wife had a work conference in Columbus this weekend and was kind enough to pick up a growler of this for me! Bodhi (pronounced bow-dee) is a sanskrit word from Buddhism which is roughly translated as enlightenment or awakening. Lets see if it’s hops awaken by taste buds to the same level of love that others give this beer. Golden honey color filled with a thick cloud of unfiltered action. Topped off with a layer of pure white head. Doesn’t look like your typical beer but does look delicious, he few unfiltered IPAs I’ve had before have all been delicious! Holy !@#$! That reeks of awesomeness! Super pungent grapefruit, pine, and mad citrus hop aroma that just blasts the hell out of your nose hairs. Definitely an awakening of the senses here. Right… after the appearance and the aroma I’m really psyched for the taste. Very hop forward taste featuring a menagerie of hop flavors like grass, pine, and all manner of citrus fruits. Some pale malt fills out the background to cascade down the tongue. 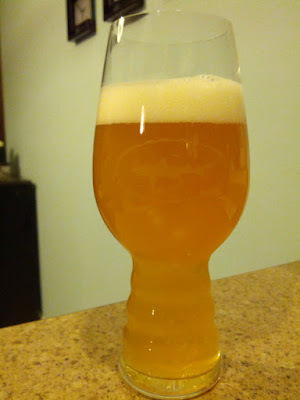 It’s actually a pretty smooth and mellow taste which only packs in comparatively to most DIPAs, mild bitterness. Definitely an east/midwest style DIPA here, very far from the super bitter west coast brews. Medium-light body with decent carbonation and a smooth dry finish, does leave some stickiness on your lips and tongue. The visuals and aromas are definitely my favorite parts of this beer but the flavor and body do not disappoint This is an all around awesome DIPA. I really wished they bottled this or at least distributed the kegs to the Cincinnati area. I don’t want to get into terms like “best” or “greatest”, that type of thing is up for each persons opinion. What I will say, however, is that this is, without a doubt, my favorite IPA/DIPA from the Midwest. I would definitely put this on the same level as Pliny the Elder and Heady Topper, but better than those this is just a 2 hour drive away! Next time I go near, to, or through Columbus I am bringing all my growlers to get filled with this luscious liquid. If you’re on a hunt for Bodhi during a trip to, or through, C-bus check out Beermenus.com. I had never heard of it before this weekend but it definitely came in handy scoring this beer!